I have a few days off worked booked, so I'm not back there until Thursday now. Hurrah!! Mark and me are going to Sheffield tonight to a club where The Prodigy are performing, we're very excited... I feel we may need some glow sticks! 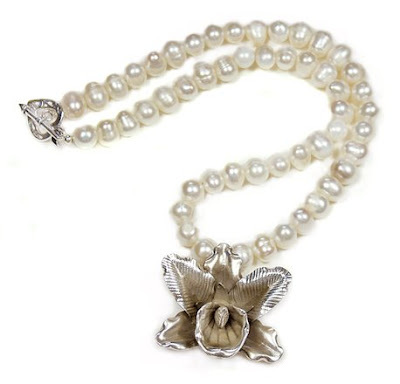 Above is a pretty, feminine necklace made with a beautiful Karen hill tribe silver Orchid and fresh water pearls. Ha! Is that you Markus, gosh it could be anyone!! !